"Brantwood, still the best poetry party in town!" from one very happy participant on last August's poetry course at Brantwood. Plenty more wonderful feedback from Brantwood participants to be added here! "I wanted to say how much I enjoyed the workshop - I found it inspiring and supportive, and you are so warm and such fun as well... thank you so much. I hope to work with you in the future." "Thank you for a wonderful workshop... and thanks for saying you don’t mind me ‘borrowing’ some of your ideas. I particularly loved the foreign language activity. Genius!" “About fifteen of us enjoyed a stimulating poetry workshop with Geraldine Green last Friday. The workshop took place at UCS, and was followed by a delicious meal, poetry reading by Geraldine and Open Mic session at Arlington's in Ipswich. The day of poetry was organised by Ian Griffiths and The Suffolk Poetry Society. I, for one, came away with pages of draft poems and raw material on subjects as diverse as gooseberries and the Caryatids on the Erechtheion in Athens! and some more rather lovely things about my workshops! “I've been on Geraldine's face-to-face and online workshops and have also booked her to lead several workshops in the past. All her workshops that I've been to have been inspirational so I highly recommend her as a workshop facilitator. She brings her poetry expertise and knowledge to the workshops so I always come away with poems that I’ve written, but also names of interesting poets to read more of. "I thought the (National Trust Create by the Lake) workshop was very well facilitated, you [Geraldine] really encouraged participants to think creatively and to feel comfortable with sharing what they had produced. Would you recommend it to others? Unreservedly! Which aspects of the workshop did you like most? Everything! · More than helpful they were great! Were the workshops well planned by the tutors? Would you come on this workshop again? Where did you find out about the workshop? · Geraldine. I came last year and wanted to come again. In overall terms did the workshop meet your expectations? · I feel stimulated and supported, thank you! · Thank you so much. I have learned such a lot in 3 days! You have given me the tools and inspiration to move on with my writing. I leave excited, inspired and pen poised. Thank you. if you're interested in my running a creative writing workshop/residential, giving a reading or a talk - thanks. "During spring and summer 2016 we enjoyed two lovely days at Eycott Hill Nature Reserve with poet and creative writing tutor Geraldine Green and two fantastic groups of writers. We explored meadows and bogs, admired vast landscapes and tiny moths, and talked about everything from lichen to lava. The writing inspired by these wonderful days on the nature reserve is featured in an anthology called The Raspberry and the Rowan which can be downloaded from the link below. If you’d like a printed copy please email jodyf@cumbriawildlifetrust.org.uk and they’ll be dispatched hot off the press! Printed anthologies are free of charge but donations to Cumbria Wildlife Trust are welcome." Dalton, ancient Capital of Furness a small town on the Furness Peninsula, hosted the first, one-day Dalton LitFest Saturday November 4th. But I’m leaping ahead of myself! 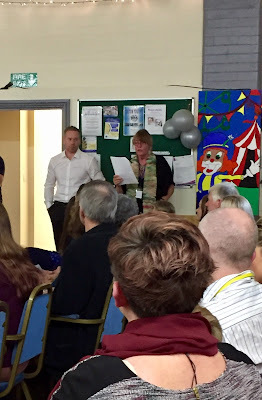 The launch itself was on Friday 3rd, when poet Kim Moore and I had the pleasure of reading out the winners of the childrens’ poetry and story competitions. Some of the children came to the front and read what they’d written, stood there: some shy, some confident, some slightly ill at ease, a little embarrassed, in front of the microphone – but they did it! And for me, it was the best part of the evening. It was such a heartwarming moment. Keeping poetry and stories alive through the next generation. Big thanks to Festival Director Ron Creer, who first mooted the idea to Kim and me, oh months ago! 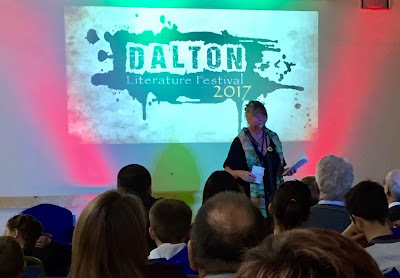 And to Margaret Martindale whose idea it was to host a LitFest in the ancient capital of Furness, Dalton. 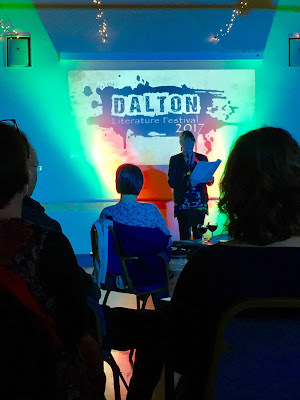 To all the writers who took part and to the volunteers, but most of all to the people of Dalton and their children. 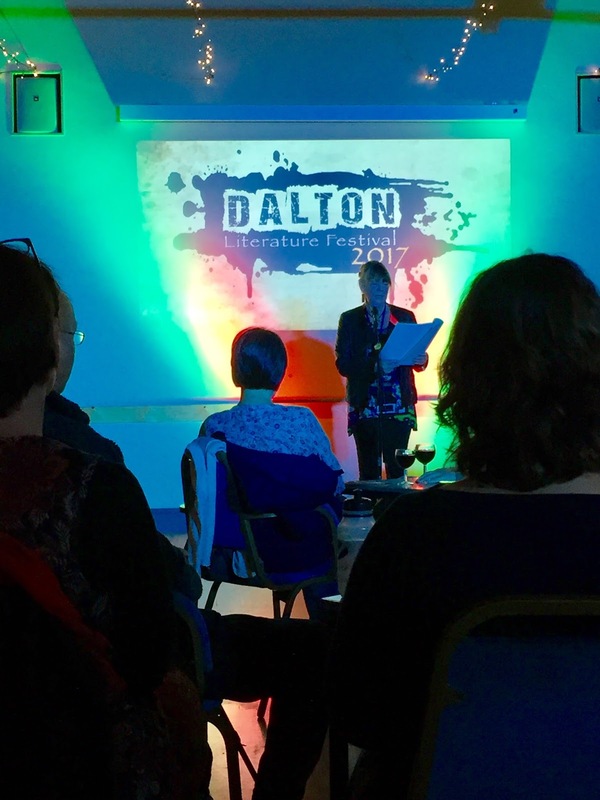 Here’s wishing everyone good luck for the next Dalton LitFest!